This is a rather unconventional way of attracting your attention to an interesting product by a young freelance fashion designer. During her work with film and television production teams, Heike Hüning´s ideas and designs developed into the now completed media jacket.This exclusive jacket, which was developed entirely for production teams and actors, is the result of the cooperation between W.L.Gore & Associates GmbH and Fuchs & Schmitt GmbH & CO. We would like to give you a first impression with this brochure. It contains a product description, technical drawings and a description of the materials used. Should you be, as we are, convinced by the quality and functionality of this innovative new product please contact us for a personal presentation. It is of course possible to adapt the jacket to your individual needs (company name, logo, colour etc). We would be delighted to hear your feedback. Meeting the special requirements of film, television and radio there is now the exclusively developed media jacket. The Hamburg designer Heike Hüning has, in co-operartion with W.L. 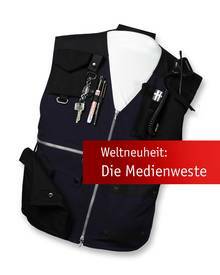 Gore & Associates GmbH, specialist for high-tech textiles, and Fuchs & Schmitt, developed a weatherproof article of clothing, which appeals to production teams, directors and actors alike as it supports their work needs to an optimum. In this 2-in 1 jacket concept GORE-TEX® material is employed to create an outer jacket which is functional, very high-quality, durable yet light and soft. It is waterproof, impermeable to wind and breathable. The seperate inner jacket is made of WINDSTOPPER® material and is also breathable and impermeable to wind as well as being heat-insultated. Many generously cut pockets for mobile phone, sunglasses and technical equipment offer ample space for all those things that need to be close to hand. 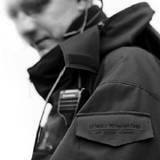 One of the newest inventions incorporated in this jacket is the walkie-talkie-pocket. Fixed into place by press-studs on the left hand side of either the inner or the outer jacket. Also the removable and reversible hood can be attached to both the outer and inner jacket. The materials and accessories have been specifically choosen to minimise the on set disturbance caused both rustling and reflections. The waist drawstring is made with elastic cord and is adjusted with string stoppers situated on the outside of the jacket. The sleeves are adjustable by means of velcro straps. Is also suitable for all manner of outdoor activities.